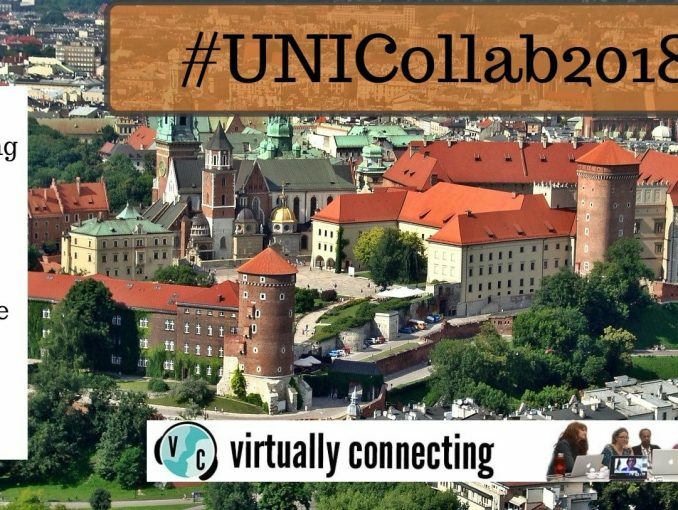 We’re Virtually Connecting from the UNICollaboration conference in Krakow, Poland April 25-27th 2018. UNICollaboration (www.unicollaboration.org) is a young, cross-disciplinary organisation which aims to promote practice and research in virtual exchange initiatives in Higher Education. Virtual exchange is an innovative form of online learning which involves engaging learners in intercultural interaction and collaboration with classes in distant locations through online communication technologies under the guidance of teachers or trained facilitators. It is also known in different contexts as telecollaboration, Collaborative Online International Learning (COIL) and e-tandem learning. Join the conversation with keynote speakers and onsite participants using this sign up google doc . Watch these conversations from whatever part of the globe you’re in, at any time that fits your time zone. Want to know more about Virtually Connecting? Take a look at this ABOUT US page. On Thursday April 26th, we will have Mirjam Hauck (President of EuroCALL) and keynote speaker Fran Helm joining Maha Bali to discuss the potential of this new network to improve intercultural understanding. You can see more about the Erasmus+ Virtual exchange project and EVOLVE here. Teresa MacKinnon @warwicklanguage will be onsite buddy. On Friday we will meet with Steve Thorne @stevenlthorne and Shannon Sauro @shansauro to discuss their experiences of this conference.